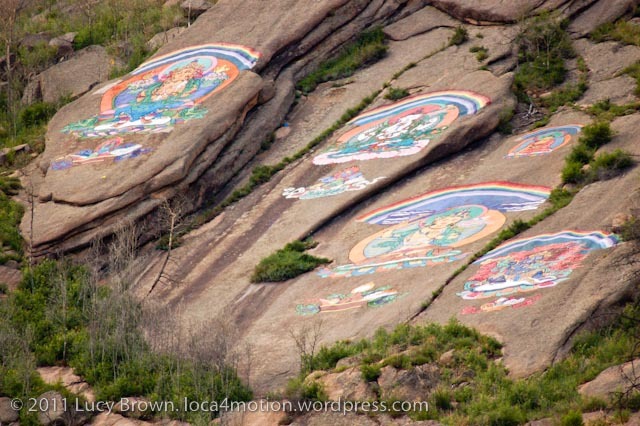 After visiting Turtle Rock, we bumped along a dirt road (the norm in Mongolia) to the entrance gates of the meditation center and strolled along a path to its hilltop lookout. 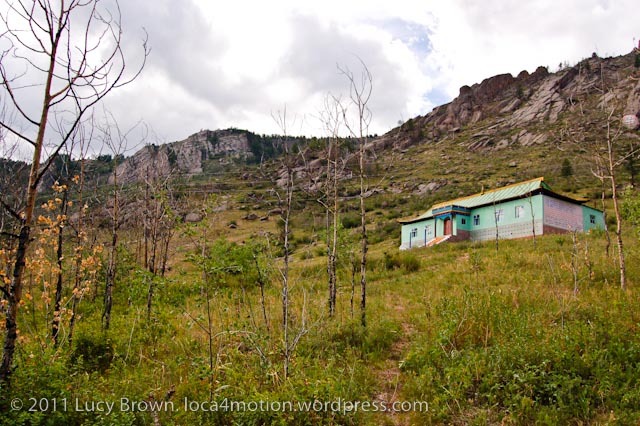 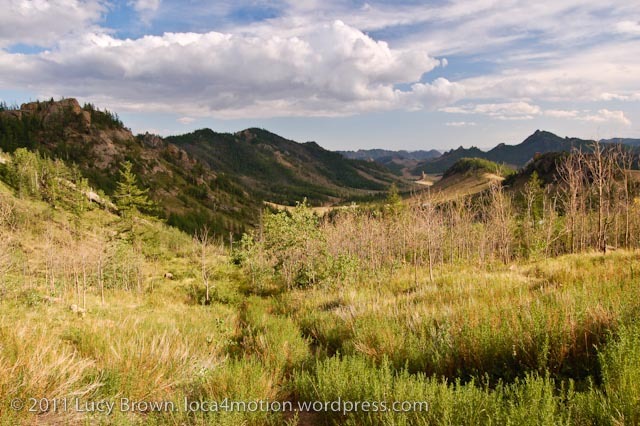 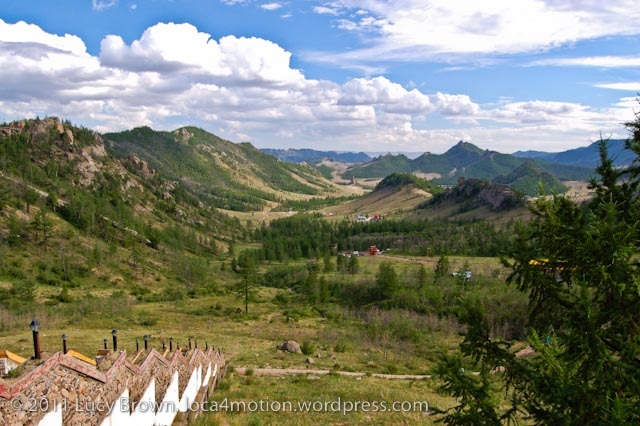 The hills of central Mongolia swept out to the horizon, greenness sloshing against the shore of blue sky. 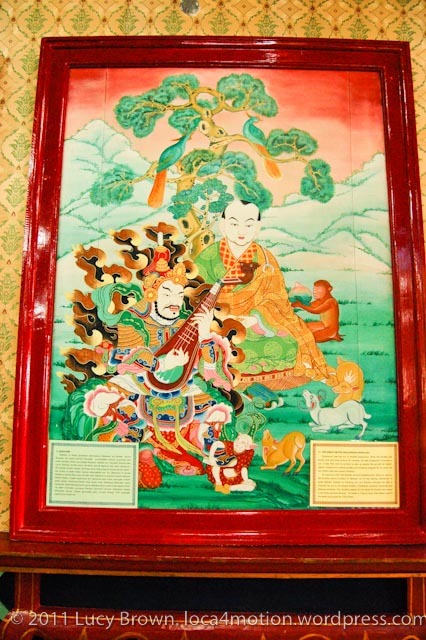 From the arrival of Soviet communist rule in the 1920s until the 1990 democratic revolution, when freedom of religion was restored, the official “religion” in Mongolia was atheism. 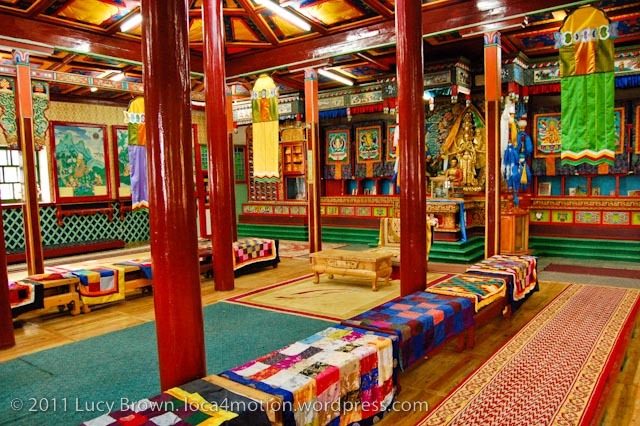 During this time, particularly during the purges of the 1930s, communists destroyed most of the nation’s temples banning and almost wiping out Buddhism in Mongolia. 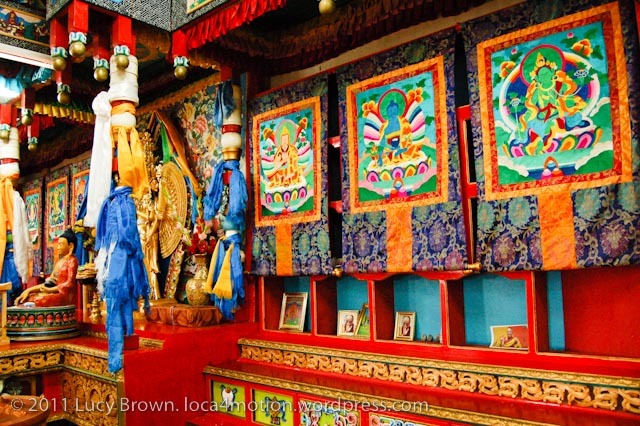 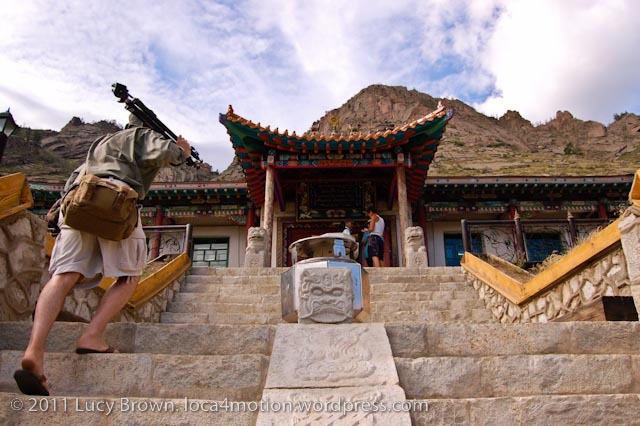 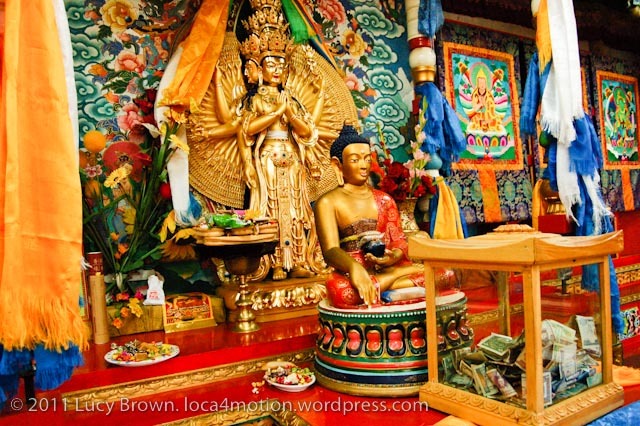 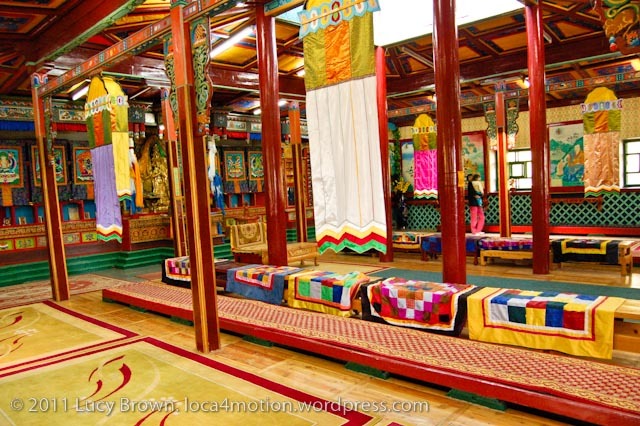 Nowadays between 50-80% (depending on sources) of Mongolian people are Mahayana Buddhist. 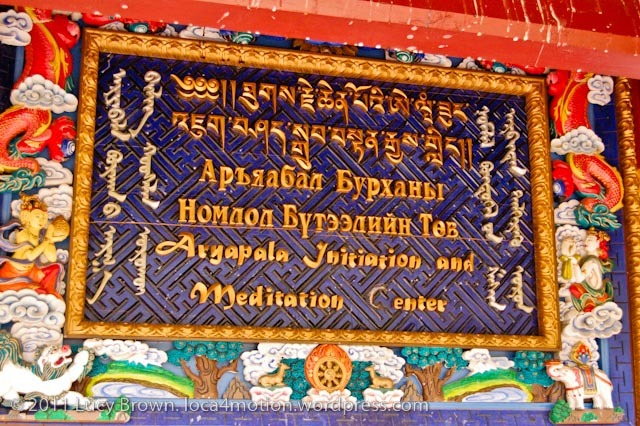 Established in 1998 the Aryapala Initiation and Meditation Center is now visited by Buddhists worldwide. 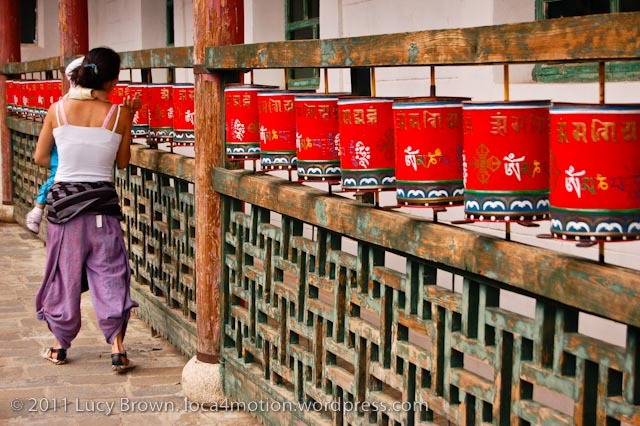 Prayer wheels line the sides and rear of the center. 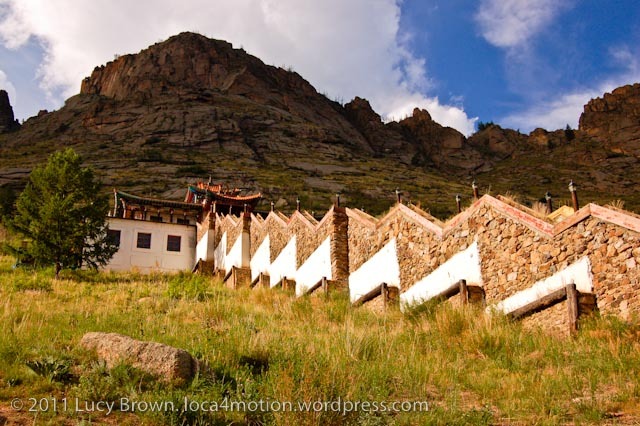 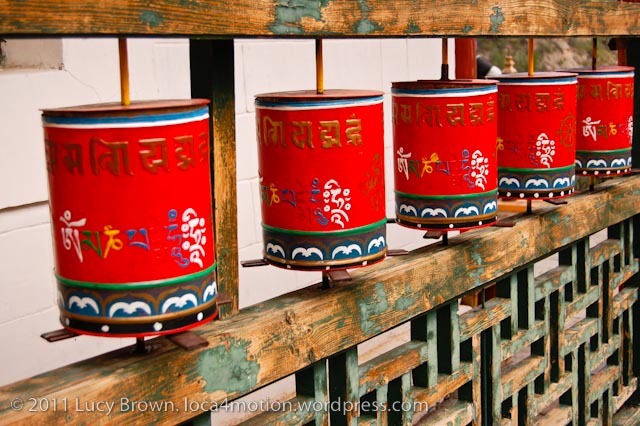 According to Buddhist custom, to gain merit believers spin prayer wheels clockwise to follow the sun while rotating the syllables of the mantra in the direction they should be read. 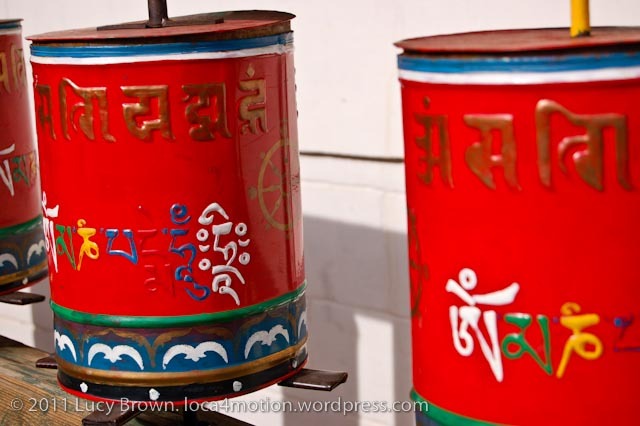 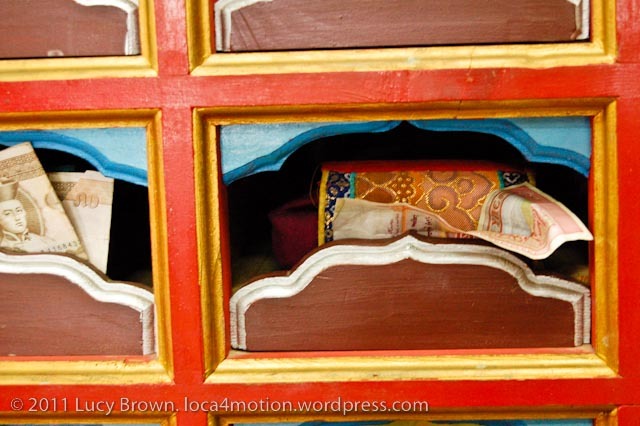 The Buddhist mantra Om Mani Padme Hum written in Tibetan script (considered the classical language of Buddhism) adorns the outside of prayer wheels and prayers penned on pieces of paper fill the hollow interior. 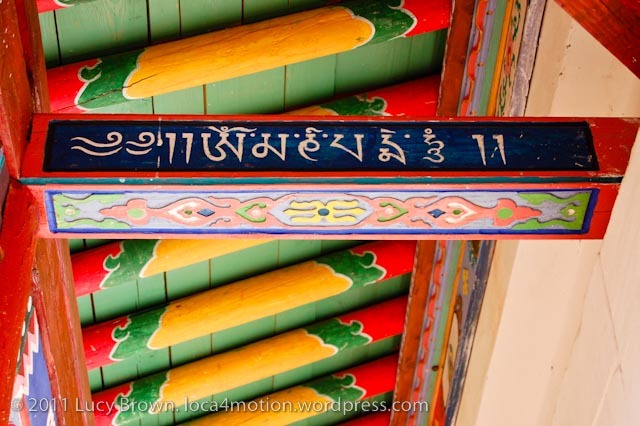 Four different alphabets cover this sign. 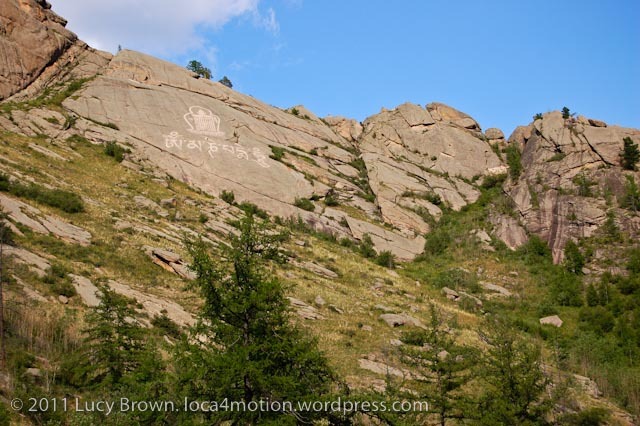 Along the left and right reading from top to bottom swirls the Classical Mongol Script. 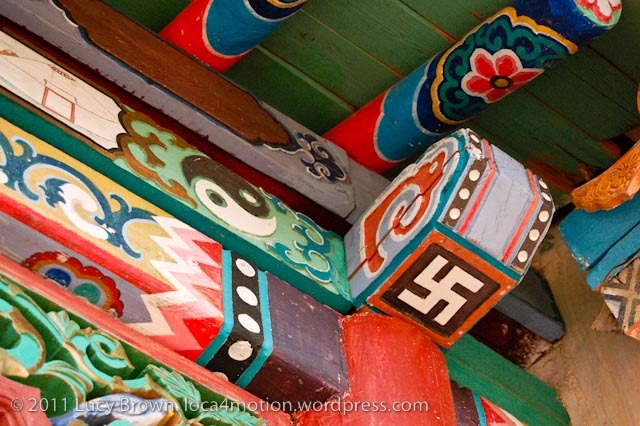 Abolished by the Mongolian government in 1941 due to Soviet pressure, since 1994 it’s been making a comeback although mostly for artistic decoration. 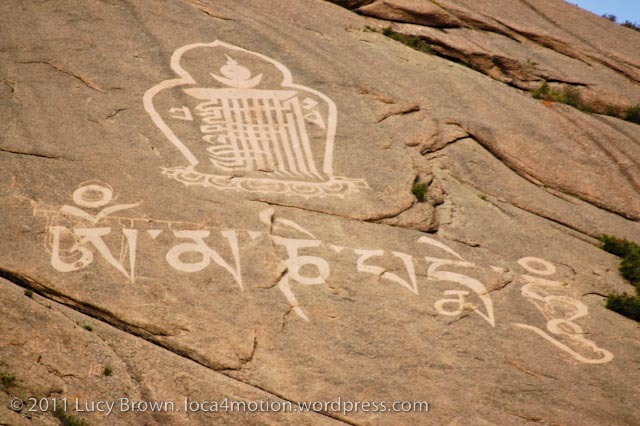 The average modern-day Mongol has little knowledge of this beautiful script. 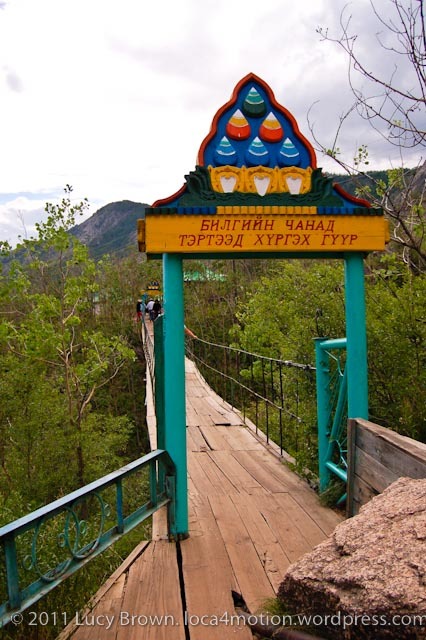 In the center is the now commonly used Russian Cyrillic alphabet. 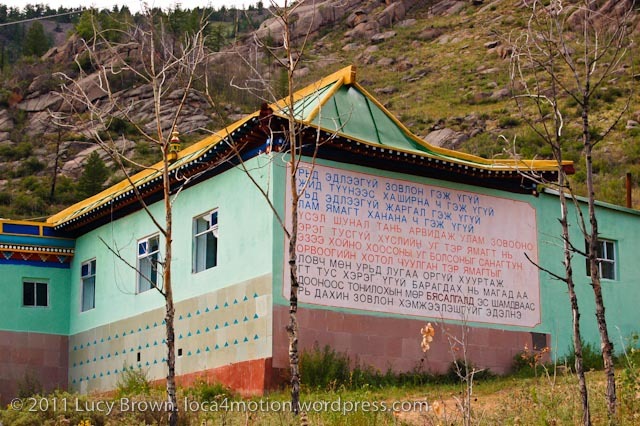 Adopted in 1937, there is a high literacy rate throughout the country. 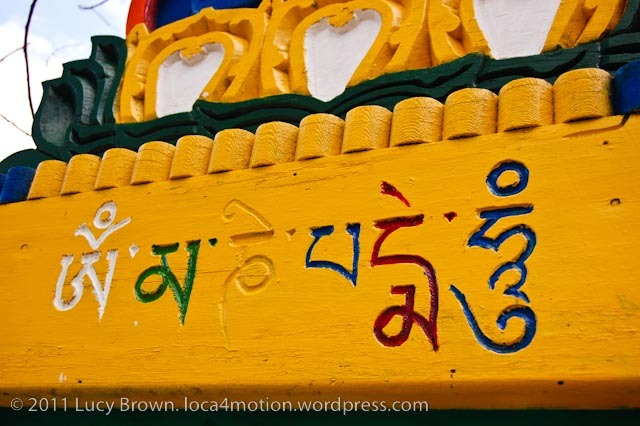 Along the top is Tibetan and finally, an English translation lies at the foot of the sign. 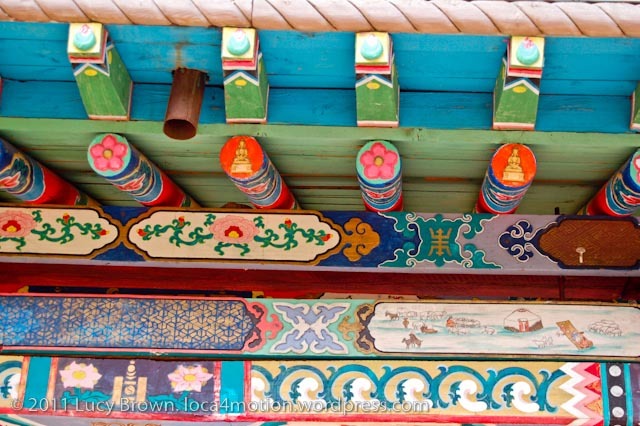 Throughout Mongolia, Buddhist traditional ceremonial scarves known as khadag hang inside temples or flap in the wind on ovoos (stone shrines). 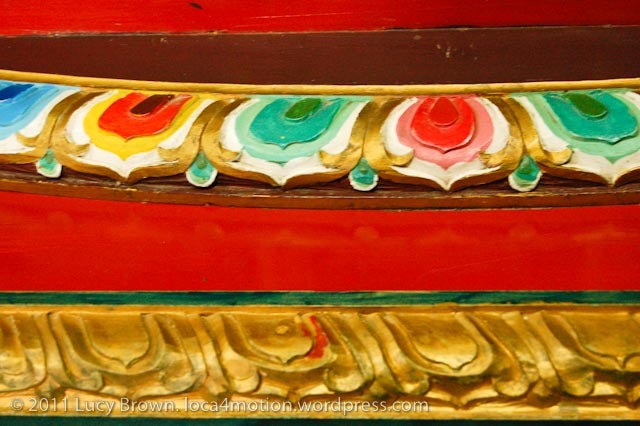 Each color holds a different meaning but the use of blue khadag is very particular to Mongolian Buddhism. 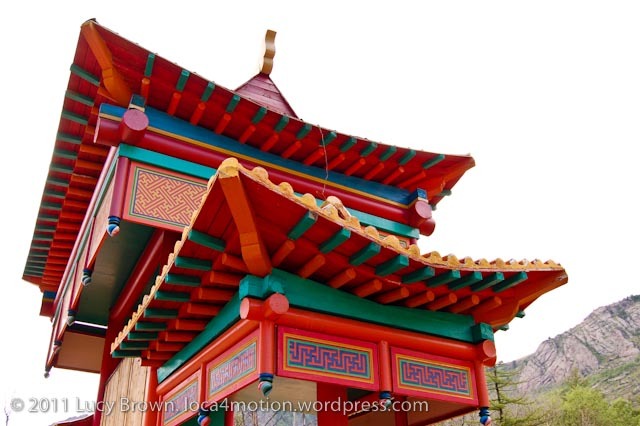 The color of respect, it symbolizes the sky, its roots dating back to the Mongol ancient shamanic worship of the Eternal Blue Sky (Tenger). 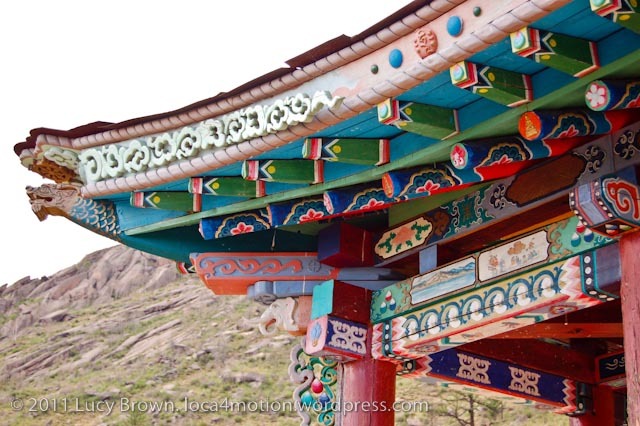 Present day Mongolian life combines both shamanistic and Buddhist beliefs. 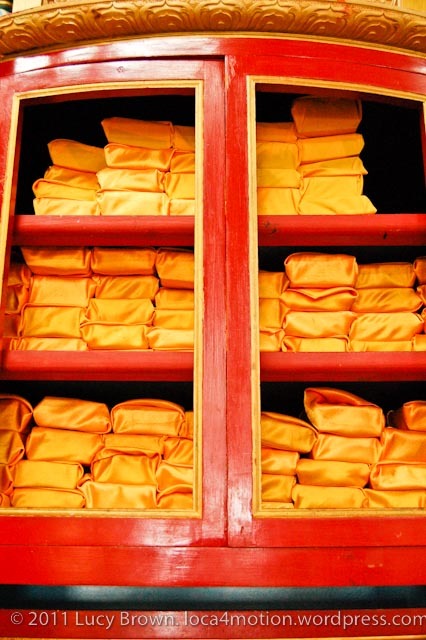 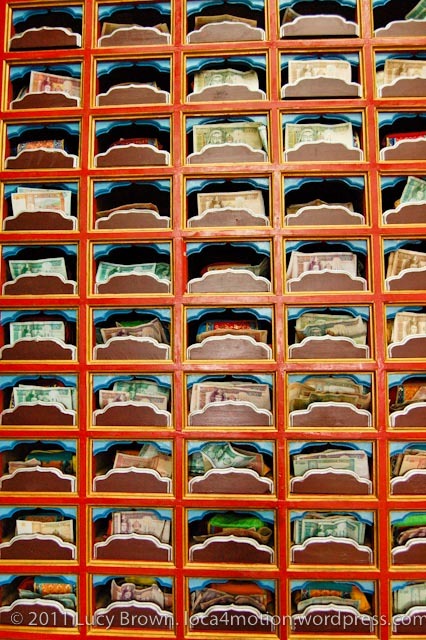 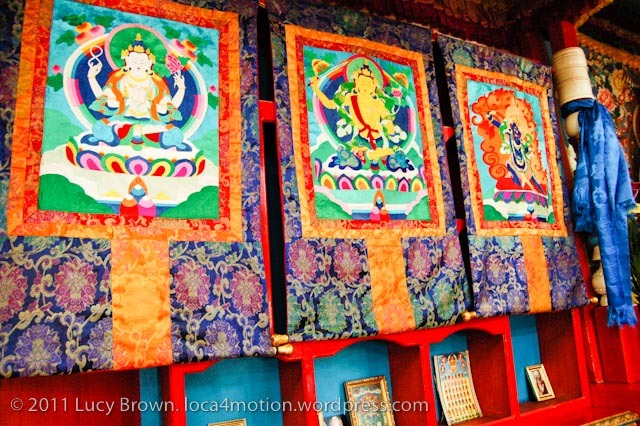 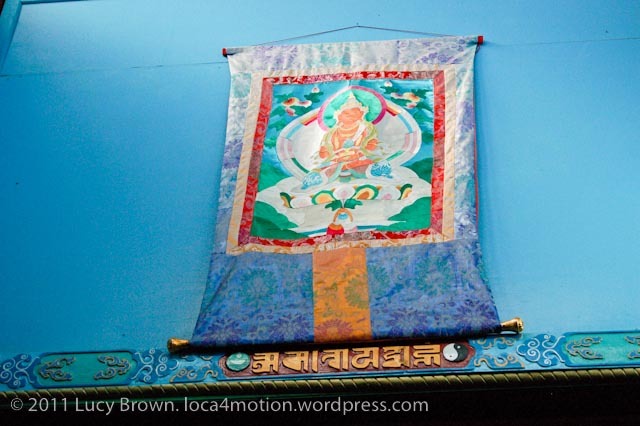 Inside the meditation centre, paintings and wall hangings portraying Buddhist teachings, painted sacred symbols and shelves containing money offerings and prayers wrapped in orange cloth smother the walls in splashes of color. 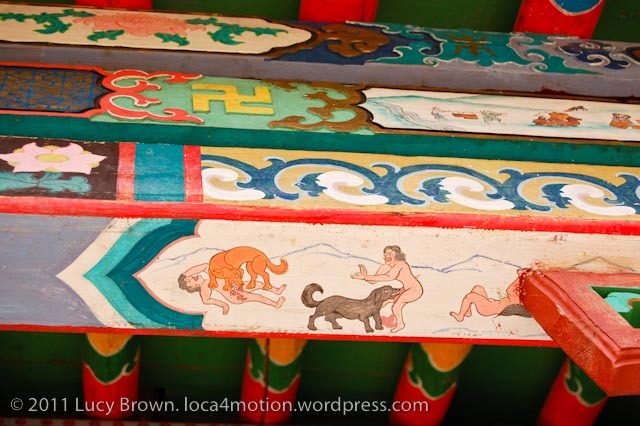 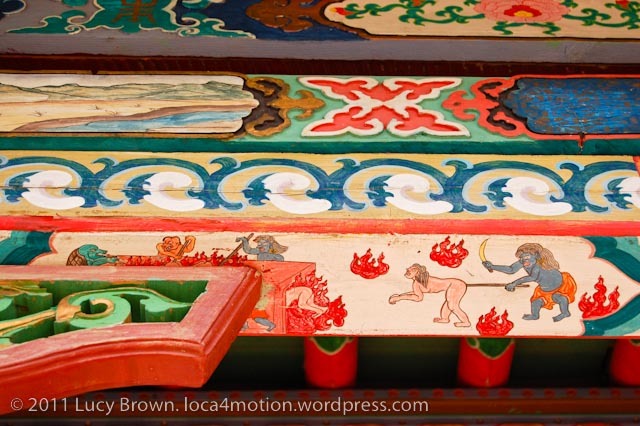 Intricate paintings decorate the exterior roof eaves on three levels. 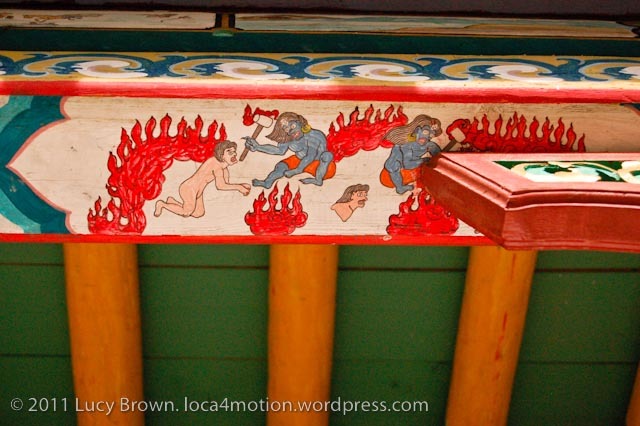 Scenes from everyday Mongolian nomadic life lie below heavenly flowers while on the belly side rage gory depictions from hell. 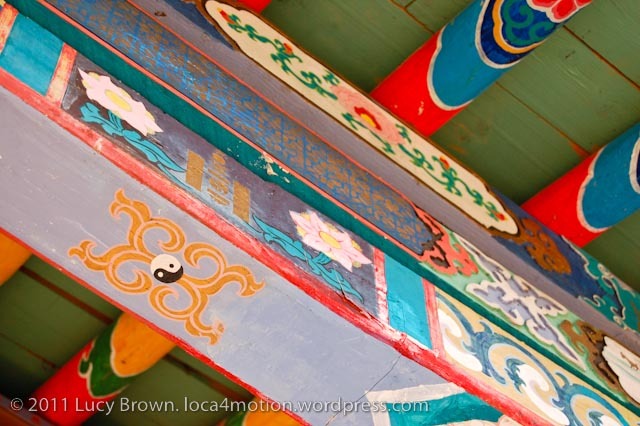 Swastikas (a holy symbol of good fortune in Buddhism) and Yin Yang (a symbol representing perfect balance) also adorn the outside.